The time has come for local initiative. The current leitmotiv is « small is beautiful », the slogan that the hippies in 1968 were already attempting to put into effect in California and Ardèche. Clearly, the third millennium in the Alps will tend to be beautifully small. The market economy spells the end of enormous development projects initiated by the central government. 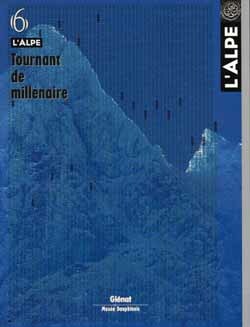 The Alpine population must take the future into its own hands. Luckily, local initiatives are not in short supply ! We simply had not taken the time to look. The Alps are headed toward serious imbalances, on the basis of the population movements observed over the last few decades, with increasingly urban valleys and abandonment of the higher areas. Is this gradual shift truly unavoidable ? Indefatigable promoter of sustainable development for the benefit of mountain populations subjected to urban pressures, Helmut Moroder presents here a vibrant appeal on behalf of the Alpine Convention. A militant and optimistic view. The Age of Discovery is over. Will the third millennium be the Age of Discovery Aids ? Anything goes when it comes to explaining mountains and exploiting their image, often in a manner bearing eloquent witness to our own distorted perception. The result is a standardised, uniform view. Are the only choices contradiction, compensation or exploitation ? What was going on in the Alps some 4 000 years ago ? Round figures are an invitation to let your imagination roam. The answers of a historian are surprisingly applicable to modern times. The economic, social and human processes at work would appear to be fundamentally the same, whether in Bronze or the Internet Age. The country fair scheduled to begin for the thousandth time in Aoste on 30 January 2000 is a venerable event still going strong. Its origins are lost in the mists of time when pilgrims and merchants travelled the Grand-Saint-Bernard road. This yearly and very festive event perpetuates a collective ritual, bringing the Alpine communities together to share their traditional crafts and trade. The end of a millennium would not be complete without an homage paid to one of the major mountain elements that has sculpted landscapes and long fascinated men. What better than the wind, the symbol of freedom and inspiration, could typify the transition to a new world, in a year 2000 that will hopefully be less materialistic and full of new ideas. Alps abroad. Artist Michael Light unearthed these grey mountains in the NASA archives and restored their original splendour using computer techniques. The result is a cosmic tour that even a Turner would probably not have scorned, a remarkable symbol for a millennium drawing to a close, with moon exploration now at a standstill. The cultural heritage of all of humanity, the Alps have again, thanks to a recent discovery, contributed significantly to our comprehension of the history and the customs prevalent in Europe prior to the nuclear war. Now protected by their status as an archaeological park, the Alps contain a vast array of remains and relics that will hopefully continue to teach us more about this lost civilisation. One-nine-nine-nine, two-zero-zero-zero… Why does the transition between these two sets of digits, both equally worthy and striking, signal any real modification in our lives ? Does anything really change when the power meter passes from 1999 to 2000 kilowatt-hours ? The year 2000. Birth of an image. It was the rainy season, with fog and its accompanying shadows, the sun fleeing suddenly before the tempest, storms worthy of the Himalayas and the raging clouds. The monsoon season with its mysterious and disquieting moods. May 1994. No tourists in this valley below Everest, in Nepal. They prefer the calm season in the fall.